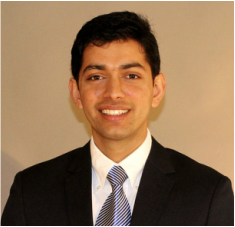 Jagat Pokharel is Global Research Analyst at Schroeder Capital Management, LLC, in Lafayette, California. He joined Schroeder Capital Management as an intern in summer, 2013 and became a full-time associate a year later after graduating from Colby-Sawyer College in New London, New Hampshire. Coming to New England from his home country of Nepal, Mr. Pokharel completed college coursework in numerous areas directly relevant to his responsibilities at Schroeder Capital including Investment Management, Financial Markets & Institutions, Macro and Microeconomics, Management in a Global Environment and Corporate Finance. At Colby-Sawyer, he was in charge of the Student Managed Investment Fund, managing an endowment fund of $350,000. The success of the fund led to recognition for Mr. Pokharel and his team as “National Champions-2013” in the Undergraduate Value Investing Category at the prestigious Global Asset Management Education Conference in New York. He graduated from Colby-Sawyer College with a Bachelor of Science degree in Business Administration with a concentration in Finance. While in college, Jagat's studies included extensive travel and cultural immersion, along with close study of financial institutions and markets while in France and Germany. In Strasbourg and Frankfurt, he proactively researched the economic and socio-political ramifications, challenges, and opportunities presented by the European integration. Additionally, he spent time in Mexico City, completing an independent field study of the Mexican political system and economy, including a detailed profile of investment opportunities in the automotive, consumer goods, and telecommunications sectors. Jagat’s skills in computer science stem from his youth in Nepal when, keen on exploring the combined use of new technology and analytics, he studied advanced computer programming and started analyzing the world of numbers using Excel and Access. He is also experienced in software development and web design. Jagat is multi-lingual with language proficiency in English and Hindi as well as his native Nepali, further enhancing his distinctive cultural perspective. With his rigorous academic training, his advanced computer skills, and his specific knowledge of international markets, Mr. Pokharel is ideally suited as a Global Research Analyst and Securities Trader at Schroeder Capital Management. Mr. Pokharel is a legally certified Investment Adviser Representative and holds a Series 65 NASD license.